Kamal Kant Batra, 69, is running for Parliament from Hamirpur in Himachal Pradesh as a candidate of the Aam Aadmi Party. In 1999, her son, Captain Vikram Batra, was killed in the Kargil War. He was 24. “Yeh dil maange more,” he had declared famously in an interview to NDTV, appropriating an advertising slogan at the time to convey the courage of the Indian soldier. In your campaigning, you have used the name and slogan- yeh dil maange more- of my Sher beta. People call him the Sher Shah of Kargil. He was just 24 when he was killed in the Kargil war. Now you are using Vikram’s name and slogan. I ask you – in 15 years, how come neither you nor the BJP used either? Just for the elections, you have suddenly remembered it and are using the sacrifice of a brave soldier. This is corrupt politics. Mr Modi, if you really care for the army and respect martyrs, a soldier’s family for you should be like God. If I were in your place, I would have withdrawn the BJP candidate who is running against me. If you respect Captain Batra’s family, you should think of me like his mother. If you used “yeh dil maange more” to praise my son…please realise…it is not enough to praise him…you should think of what can be done to honour a martyr’s family. Why was no one from a soldier’s family given a chance by the BJP earlier to run as a candidate? For me, this is not a fight with an individual. It is a fight against corruption. People want relief from corruption. All of India knows Vikram Batra. 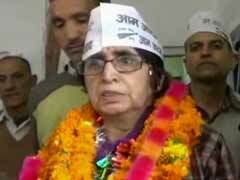 In some villages, Aam Aadmi Party workers say “this is Shahid Vikram’s mother.” There is nothing wrong with that. He did sacrifice his life for the nation. He would be proud that I want to serve his country. Even if my son’s name comes up, isn’t it my right? Your name is everywhere in this campaign. Only Arvind Kejriwal’s party thought of honouring us this way, asking us if we would like to contest. I want to help people. I am not just a woman but a citizen. I have the right to join politics. Every citizen has. When I got the offer from AAP to contest the election from Himachal Pradesh, I could not refuse. Other parties have failed us.